The villa is set on the edge of the village of Dogankoy, inbetween the Villa of Ozankoy and the town of Kyrenia/Girne, also 5 minutes from Bellapais making its position perfect for exploring the island. Only 1 mile to Girne (Kyrenia). A large supermarket is about a 5 minute walk. The villa boasts fantastic views of the mountains. It is in a small cul-de-sac, consisting of 7 villas, a peaceful location but near enough to town to meet all your needs. Villa Mumbet completed in Feb 2005 & furnished to the highest standards. It is a 3-bed villa with two dbl bedrooms & the 3rd bedroom has two single beds. The main bedroom has a ensuite bathroom & there is a family bathroom. There is also a downstairs shower room. ALL BEDROOMS HAVE AIR CONDITIONING. The pool is particularly suitable for young children and non swimmers and pool towels are provided to enable you to cut down on that bulky luggage. Air conditioning in all bedrooms, water cooler in the kitchen. To the side is a large covered area with dining tables& chairs, traditional benches to give additional room for Alfreso dining. Want to know more about Villa Mumbet: The villa is set on the edge of the village of Dogankoy, making its position perfect for exploring the island. It is only 1 mile to Girne (Kyrenia). 2 large supermarket about a 5 minute walk. The villa boasts views of the mountains. In a small cul-de-sac, consisting of only seven villas, a peaceful location but near enough to town to meet all your needs. Villa Mumbet was completed in Feb 2005 and furnished to the highest standards. Pay as you go mobile phone provided for your use to enable you to contact us or book restaurants, taxis etc. 2 music centres for indoor & outdoor use, large selection of CDs & Up to date DVDs. Bookcase with variety of reading material. IP Docking station. Internet available upon request, payable upon arrival. SPECIAL EVENTS, Weddings, that special birthday & you want all your family and friends to be near you. See below. Management: As residents living in Bellapais we do not use a Management company to look after the villa, choosing to do it ourselves, we feel we can give a far more personal touch to your holiday. Hope this is of help to you, if you require any further assistance or need to ask any further questions please do not hesitate to contact us as we have lots of general knowledge having lived here for over 8 years now. North Cyprus is the Med's best kept secret: Loved for its slow pace of life, and welcoming hospitality. Kyrenia and Famagusta combine beautiful bays and enchanting sights with a sunny Cyprus climate all year round, making it an ideal holiday destination. Northern Cyprus is located at the crossroads of three continents, and just 40 miles from Turkey. Previously a British colony, the island's European influence means that, although Turkish is the official language in North Cyprus, English is still widely spoken and everybody drives on the left. Special Events & further info: SPECIAL EVENTS, Weddings, that special birthday and you want all your family and friends to be near you. 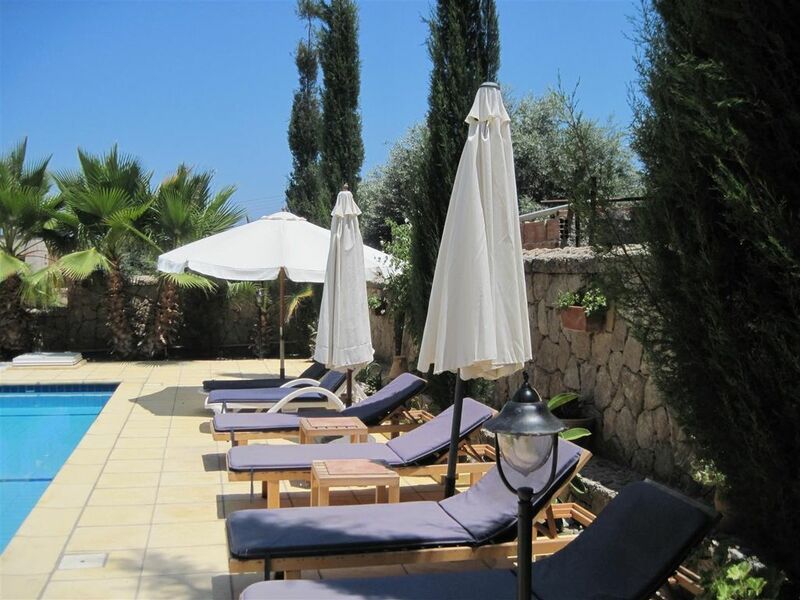 Villa Mumbet is situated in a quiet cul-de-sac were 3 other villa are also available for rent. The villas are ideally situated near to Bellapais for that special Wedding day and all the would be Bride and Grooms family and friends could be near you. See reviews regarding location and car hire. North Cyprus is bursting with intriguing antiquity and a rich cultural history. The coastline is astonishingly beautiful with its ancient Kyrenia harbour where you can dine al-fresco and Kyrenia and Famagusta beaches that stretch for miles, whilst the depths of the crystal-clear azure seas offers many of the Cyprus region's best dive sites. A labyrinth of craft shops, ancient sites and family-owned restaurants await exploration in North Cyprus' vibrant towns of Kyrenia, Famagusta, Nicosia, whilst idyllic scenery and ancient rustic villages gently dot the countryside. Location. Your Home from Home is so near to Kyrenia, for those who do not want to hire a car and can use local Dolmus and taxi's. It is also very near to Ozankoy Villa and beautiful Bellapais with the historic Abbey. Villa Mumbet is not just a holiday home it is home form home with your every requirement. We are living here and can be on hand any time you need us. Flights: Flights to northern Cyprus go from Heathrow, Gatwick, Stansted, Luton, Manchester, Birmingham, Belfast and Glasgow with Cyprus Turkish Airllines via a short stop in Turkey - you don't get off the plane with Pegasus - or Turkish Airlines, via Istanbul means a change of plane at the airport. The Turkish airline Pegasus flies to Ercan via Istanbul. Contact us if you require advice on flights to Ercan. Journey time to the villa is 35 mins. You can also fly daily to Larnaca in the South with British Airways (BA.com) or Cyprus Airways and get a taxi direct through the border to the north, taking 1hr 20 min. We can arrange for the taxi to collect you and we can arrange hire cars in the north as well. Some charter flights go to Larnaca from regional airports. Easyjet flies from Gatwick to Larnaca and now Liverpool to Larnaca. INTERNET FREE outer available enabling you to choose just laptop or Ipad connections. Bath & hand towels provided for each guest with hand towel in each bathroom and the benefit of a beach/pool towel for each guest to cut down on that bulky packing. Large fridge with small ice box type freezer. Fully fitted units, kettles, George Forman Grill, Toaster. Glasses for every occasion & drink. Water machine holding 19 litre capacity, water bottles can be ordered, delivery is free. Dine Alfresco in the shade under the Gazebo or in the sun, both tables accommodate 6 people. There is also a hand crafted/painted dining table in the dining area in the kitchen , 3 choices , enjoy. Lots of games to occupy the children in particular when they need to keep out of the sun or tired of the pool, do you think that will happen!? Each bedroom has it own balcony with table and chairs. The beautiful historic harbour of Kyrenia has daily boat tours and you can hire a boat to go fishing. Details are provided of the companies in the villa. The terrace surrounds the pool area. The pool is for your use only, set in the garden with plenty of sunloungers and shade when required. Pool Area, the pool is probably our favourite feature of the villa, it measures 8m x 4m, private pool with underwater lighting, & access from Roman style steps. The shallow end is less than 1 metre deep and perfect for young children and non swimmers whilst the deep end reaches under 2m for older children/adults to really cool off. There is also an Outside pool shower if you don't want to have a dip to cool down. Also available are sun loungers, pool towels, large umbrellas and table and chairs to while away the those lazy sunny daysin the sun or under a covered Gazebo area, which of evening you can sit under the fairy lights. There is a wonderful bbq area with full preparation area for those Al freso nights by the pool. Ercan airport in Northern Cyprus is 45 minutes drive from the villa. Larnaca airport in southern Cyprus is less than one-and-a-half hours drive . We can help with transfers adn car hire. Lovely stay in this home from home. Cathy the owner was very helpful, with recommendations, arranging car hire and a welcome pack of essentials. We would recommend a spa day at the Lords Palace Hotel for a great way of spending a day when the weather isn't so good. It was our first visit to Northern Cyprus, so we hired a car (which Cathy helped to arrange at a very reasonable price) so we could explore at our leisure.. But the best part of the stay was having Cathy on hand to help if you needed her....she provides a mobile phone which has some very useful numbers already saved in the contacts and is more than willing to point you in the right direction for restaurants, beaches, supermarkets etc.. Thanks Cathy for a wonderful holiday...we plan to be back! As described, this property really does provide everything you could possibly need for a relaxing villa holiday. It is spacious, both inside and out, with a variety of spaces sit/lay and relax. The covered outdoor seating area was a god send for getting out of the intense mid-day sun whilst still enjoying alfresco dining. The villa itself was spotlessly clean and the provision of a welcome pack was perfect and Cathy was kind enough to also grab us a few beers ready for our arrival (they were very welcome indeed!). The owners, Cathy and Reg could not have been more helpful. The provision of a pre-paid mobile phone was a genius idea. It held both their numbers and that of useful contacts such as the water bottle delivery (just 6lira for 19 litres!) and a variety of restaurants. Cathy also gave us details of beaches etc. that are easily accessible using the local bus service (Dolmus), excellent value for money and very frequent and ideal fir us as we did not hire a car. All in all, we had a wonderful holiday at this lovely villa and will no doubt return in the future! Villa Mumbet is a great place to stay just outside Kyrenia in a relatively quite cul-de-sac. Owner Cathy was exceptionally helpful and provided some very useful tips on local facilities and events which were much appreciated. The very local new mini-market was a godsend as walking any distance in the summer heat was a challenge! Although we hired a car, we took taxis into the Harbour and Bellapais when were eating out and the services were generally very good and pretty cheap - £4-5 into the Harbour for 4 people. Only thing missing from the villa was a dishwasher and a little larger freezer compartment in the fridge - very minor inconveniences really! Ensuite shower is very small, with a shower curtain, but a little water on the floor soon dries in the everyday heat. Be prepared for regular visits from at least one cat who are remarkable difficult to dissuade from following you into the villa, and occasional bursts of multiple dogs barking as they set each other off. Some great outside space around the pool offering much needed shade and somewhere to eat after dark. Pool is perfect for a quick cool off, although the temperature was so warm it was more like a bath! Not really suitable for swimming as rather shallow - but great for kids to play in safely. All in all, a great place to stay in Northern Cyprus - thoroughly recommended! The villa itself is brilliantly equipped with everything and more you could wish for - a spacious kitchen; air-con in all bedrooms; fast wi-fi which even worked outdoors; a useful mobile phone was provided to make restaurant reservations etc; and even a George Foreman grill to fry some halloumi! But it was the outside space which really stole the show. The pool is a lovely size and a nice temperature for cooling off. There are plenty of sun-loungers so there's no fighting for space, with many umbrellas to shield the sun in the heat of the day. And there are various great places to eat or have a drink outside, especially under the permanent gazebo. As non-cat lovers, we were a little bit worried when we saw a few kittens roaming around, but by the end of the holiday we were completely besotted by them and very sad to say goodbye! The location, too, was excellent - we didn't hire a car and never regretted it once. A large supermarket is in easy walking distance and we really made use of the 'dolmus' (minibuses which go up and down the main roads) which are very frequent and cheap. We went to three different beaches during our 10 days. None were more than a 15 minute dolmus ride away and our favourite was the quieter 'Shayna beach' which has a simply amazing fish restaurant above it which serves stunning fresh fish meze for extraordinarily cheap prices (55 Lira). Other restaurants we would recommend include Bella Moon (Bellapais, with a free taxi service to and from), Niaze's (Girne harbour), and Kybele (a little bit more expensive but in an incredible location in the Abbey's grounds, and again with a free taxi service to and from). And to top it all off, there was Cathy. Cathy made the booking process so simple (booking us a transfer to and from the airport), took us shopping on our first day, gave us invaluable recommendations and advice, and even took us to her favourite beach (which proved to be ours as well) - she was simply amazing and made our stay in Cyprus all the more enjoyable. The villa is set in a beautiful garden which is extremely well maintained and we particularly liked the enormous cacti which really set the grounds off. There was an area by the kitchen door with table and chairs where you could eat breakfast in the sun and then on the other side of the pool with a built in barbecue and fixed shading next to it were a dining table and chairs which was a perfect spot to eat lunch and keep cool on a hot day. The pool was cleaned twice a week with lots of sunbeds and umbrellas around. We loved sitting on the front terrace by the front door on the padded seating benches, which had a lovely breeze and were ideal for afternoon tea, reading and snoozing. The Villa was extremely nice and very well equipped with everything you could possibly ask for including a George Foreman grill which was ideal for quick grilling. The welcome pack on arrival was very welcome. The villa is in very good condition, though a tad old-fashioned but was very spacious for us 4 adults and you really felt relaxed and utterly comfortable. The bedrooms were large with good air conditioning and lots of storage space. Pool and bathroom towels were provided and there is a utility room so you can do your washing and drying all on the same day before going home, if you fancy. Although we had a hire car, we tended to walk to the local restaurants: Alestars (great dinosaur pork chops) and Asian City street food for a quick stir-fry, and we would drive about 7 minutes into Kyrenia for others. Kyrenia is very nice with a lovely harbour and quayside restaurants, but we tended to eat in places away from the harbour like The House, Liman Hotel (thoroughly recommend) , as well as Meyhane restaurant in Zeytinlik who do great mezes, but don’t over-order as portions are enormous. I would thoroughly recommend a hire car as there is so much to see in Northern Cyprus and the surrounding areas are fantastic and although we have been there many times, we are always finding new sights to see in out of the way places which makes it really special and it is not overrun by tourists but laid-back and interesting. Do, if you are walking into town visit the two small British Cemeteries if you get the chance. We really enjoyed our stay at Villa Mumbet and would certainly recommend it and will definitely stay there again on another visit. Cathy is extremely friendly, pleasant and helpful. Dogankoy is a typical Cypriot Village, very near to Girne Town Centre and Ozankoy Village and a very short drive to Bellapais. The old & new harbours are within walking distance on a fine day as is the town centre for shopping! There are restaurants also within walking distance for the villa. Dolmus (local taxis) can be picked up from the nearby road (not so near that you can hear it) to take you all over the island. Other Activities: There is now a new Bowling Alley and entertainment centre within a 10 minute drive from Villa Mumbet. Golf: The new Esentepe Golf course is now open, all details can be found on their web sites including details of the beautiful restaurant and their entertainment calendar. www.korineumgolf.com Situated on the Coast at the foot of The Five Finger Mountain in Esentepe, the prestigious Korineum Golf & Country Club is proud to be the first 18 holes golf course in Northern Cyprus. Carved from a natural forest of Umbrella Pines and Olive trees, amongst others, with stunning views of the Mediterranean Sea on one side, and breath taking views of the famous Five Finger Mountain range on the other, this makes for a truly memorable experience you will never forget. Orchestral concerts are regularly held at the venues listed below. If you are lucky enough to catch a concert at the Bellapais Abbey, it is sure to be an unforgettable occasion. Kyrenia: Bellapais Abbey, Bellapais Kyrenia Castle. Prices are for the property per week in UK pounds absed on 4 sharing, there is a £25 per person per week for the 5th and 6th person. A 25% deposit is required to hold the booking, balance is required 8 weeks before arrival. Air conditioning, we request guests to respect the use of the air conditioning that at the moment is included in the rental price but if the bills are deemed excessive the prices will have to change to reflect this.